All functions can be viewed and monitored on the large, clear LCD display. 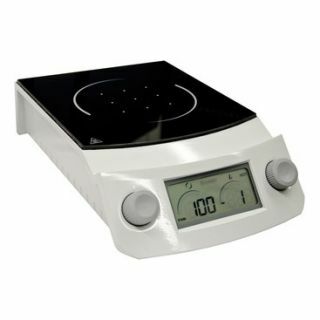 The stirrer speed range from 100 to 1000/min and can be set in steps of 10/min. The heating power can be set in 24 steps and reaches an average heating output of 0.9 kW at step 24. If a Pt 1000 temperature sensor is connected which enable a temperature control between 25°C to 200°C at an accuracy level of +/- 2° to 5°C as a function of liquid volume, heat capacity and ambient temperature. The display will inform the user at intervals of 5 s about the actual and the set temperature.